Cleaning the shop is not in my top ten list of fun things to do with my weekend. In fact it is in a separate list right after touching old band-aids on the sidewalk. But, I will admit that when the job is finished I feel much more organized and productive (cleaning the shop, not touching band-aids). This weekend, I had the perfect reason to clean up and clear out some old shop junk, I had my electrician (father-in-law/master electrician) coming to help me put in some new outlets, additional lights and wire up some 220v machinery that has been collecting dust. While I have a deep rooted love for meat powered tools, the efficiency, capability and cool factor of many electron powered tools assures them a spot in my shop. I have been using lots (and lots) of extension cords to run most of my powered equipment, and some small task lights...until now. We had been trying to schedule time to get the wiring done for a very long time, however, with busy conflicting schedules it seemed like it may never happen. Now I can finally (and properly) use the dust collector, bandsaw and a couple other cast iron paperweights to their full potential (well, as far as my limited ability can take them). I must admit, I was a bit like a kid at Christmas after we finished the wiring, it was....energizing (HA, see what I did there?)!! Fortunately, I planned for a rather large electrical service to the garage (ahem..shop), which I'd recommend to anyone planning shop space. More power means more room for electrical expansion and versatility, even in the smallest shop (and more tools!). My Electrician Hard At Work? All that cleaning got me thinking about my shop layout. I have made efforts to put everything I can on wheels or castors so I can shift equipment around within the limited footprint of the shop, but upon cleaning the shop I found that I still had a lot of things stored under shelving on the floor. 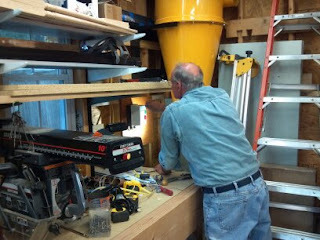 The next movement in the shop will be to get as much stuff up off the floor and organized onto shelving as possible. Having the floor clear makes for easy cleaning, a much neater appearance, more legroom at the bench and more space to move around. I'd recommend this small step to anyone feeling cramped in their workshop, use your walls and ceiling space (if available) for storage and keep the floor open for...well, everything else! For material handling tools, they use heavy duty casters. The heavy casters are used in multiple industrial applications. The industrial applications include tow line in plants, platform trucks and carts assemblies. The caster wheel is designed to operate on a flat and smooth surface.